Morzine, France, January 2, 2006 - I managed not to get hit by any helicopters while skiing in the Alps last week, and I'm thankful for that. A coworker of mine went skiing New Year's weekend as well, and broke his leg right at his hip joint after wiping out on a patch of ice and landing on it. I hate hearing stories like that. Thankfully, Sue and I have never been injured while skiing. Most people don't get injured while skiing. And one can be unlucky enough to slip on a patch of ice while merely walking on the sidewalk and break both arms, as Sue's dad once did. Still, I hate hearing stories like that. Morzine was lovely, even if the sidewalks were scarier than the slopes (they seem not to have yet gotten the concept of snow shovels there), Paris was great, Switzerland extorted 30 Euros from us, and I will try soon to get around to writing all about it! 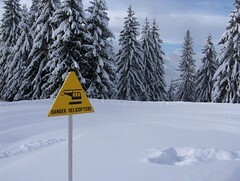 That is an unexpected skiing hazard! !